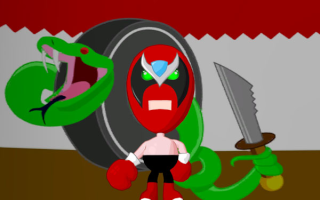 Looking at that "Woody" picture again, the artist actually made Strong Bad's head have wood texturing too, which is kind of ridiculous. I actually laughed. Maybe you have a chance after all, Wheeler Dan. Yeah. I don't think that's gonna win it for me. Voting's up! So, y'know, maybe help out. Again: Link? To the TOPIC, not just the POST? Man, there are some really crappy entries up there. It kind of makes me want to puke my pants. Into my pants. Repeatedly. I wonder what's gonna happen if this massive tie sticks around. Which I hope it does, because the massive tie is what's keeping my entry in the top four. Wait-the current winner is "Clothespin and also toothpick Trogdor"‽ Seriously? That's just sad, man. That thing was clearly a piece of crap. EDIT: Replaced "?!" with "‽." Ah, the Interrobang. The best, coolest, and least-used punctuation mark ever. Y'know what's even worse? TGS fantoon just knocked me and all the other two-votees out of the top four! A pants-puking is in order, then. So like, if any other SBtFers are reading this, have a Telltale account, and haven't voted yet: Support Woodland Homestar! Contest is over. Thank for yer votes guys! I may have only gotten two votes, but that's still good, right? ...Of course it is! Because Alan (Telltale's Community Manager) just informed us that everyone with at least one vote gets a free season! Hot Pooey! I KNEW I should've joined. Still. Glad to support a friend.